Updated on Saturday, Nov 25th, 2017. The downloadable file is still the original entry. This was . 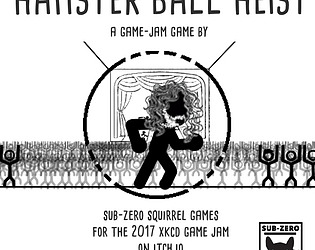 . . ok.
HamsterBall Heist presents itself as if we're playing as the people from the original comic, going to steal Wayne Coyne in his hamster ball. 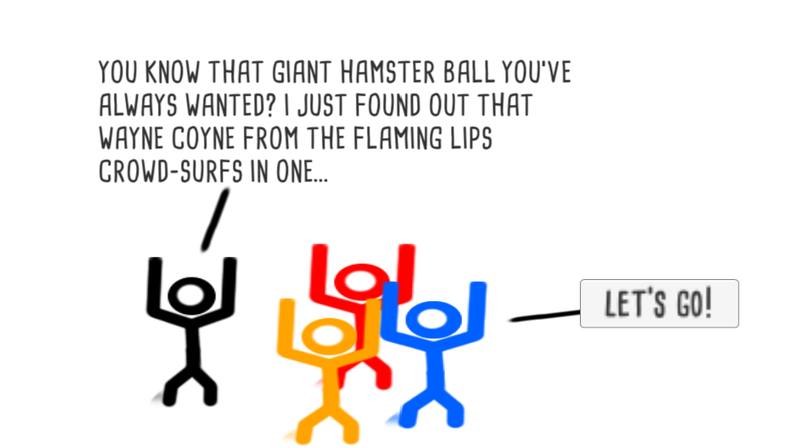 But then it turns out we're playing as Wayne Coyne and trying to avoid the people who want our hamster ball (or rather, want to kill us, since we "die" if we lose health [partially b/c of the hamster ball thieves]). Ok then? I didn't personally find the crowd surfing all that fun--I usually only bounced once, and crowds were generated in such a way that I usually had 1-2 rows of people, so I had to go to other rows to try and find some better energy. But that's how I found out I lose health when I touch the floor--(1) why? and (2) if I lose health when I touch the floor, why is there so much space between rows, and why does 1 row generate close to me with another row a good distance from me? Also, the "lose health" sound gets grating fast. Moving in this game does not feel good; you're basically at a crawl in that hamster ball, and your jump isn't that high at all. I did find out that by tapping the spacebar, you can jump basically infinitely, but you can only go straight up as far as I can tell, which doesn't help much. 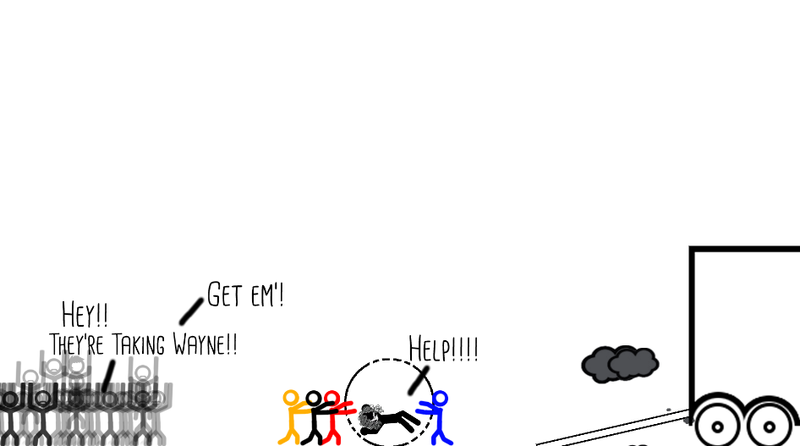 Especially in the second level, which was super frustrating because of the terrible jump and sluggish movement--paired with an orange stick figure who will push you back, and various objects that will do the same. Ugh. Really wish there was a timer in this game. The goal seems to be to survive levels a certain amount of time in order to move to the next one, but it's never clear how long you need to survive for. Along the way you can get health pickups and marijuana--I thought the marijuana made you invincible for a short period, but I still lost health. What does the marijuana do? All in all, this was ok. Not great, not the best either. Probably won't play it again, but maybe someone else will like it more than I did. I went in and noodled with a couple settings after reading this and realizing you were right. Added a few more crowds and explained that hitting the floor is bad crowd surfing mojo (not health). Working on extending the intro to shift the focus over to WC instead of the original plot. The powerups give you more jump force so you can get "higher." Although I like the invicibility idea. We'll reply back if we decide to implement these changes. Thanks for playing and leaving feedback. We implemented some changes. Check our page for details. We hope you enjoy it more now! Hey thanks! We'll be sure to watch!